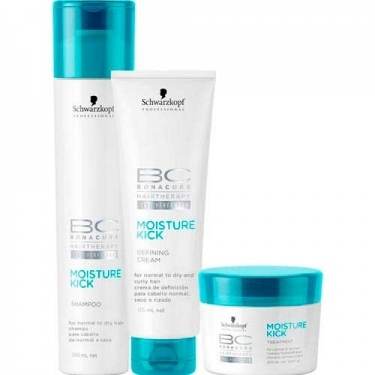 Moisture Kick BC Bonacure Schwarzkopf is a moisturizing hair care range to enhance and balance moisture levels of even the most dry and fragile hair. The hair feels healthy, shiny and rehydrated. New hair care line for normal to dry wavy or curly hair that?s coarse or brittle, lacking elasticity and bounce. The formula with hyaluronic acid derivative deposits the optimal level of H2O in the capillary structure to regulate and balance moisture levels. 100% nourishment and up to 85% improved combability. - Provides balanced lasting hydration to hair and scalp. No other natural substance has the ability to carry more acted molecules than hyaluronic acid. - Acts as a burst of moisture that penetrates the hair for a intense moisture. 2 - Amino Cell Rebuild - Cortex Cell Perfector aActs to perfect the cortex, rebuilding the architecture of the hair from the inside. Moisture Kick Shampoo cleanses normal, dry or wavy hair with a lightweight foam providing essential moisture. For a soft, supple and hydrated hair with utmost bounce and healthy glow . Moisture Kick Spray Conditioner detangles and smoothes the surface of normal, dry or curly hair offering the utmost moisture. For soft, flexible and hydrated hair with top bouce and healthy shine on each strand. Moisture Kick Treatment is a deep hydrating hair mask for normal to dry , fragile or curlyhair. Moisture Kick Beauty Balm is a moisturizing caring balm and finishing treatment to protect hair against heat stylling tools. Shampoo: 1 - Apply evenly to damp hair; 2 - Gently lather and massage your entire scalp; 3 - Rinse thoroughly; 4 - Repeat if necessary; 5 - In case of contact with eyes, rinse them immediately. Conditioner: 1 - Apply evenly to damp hair; 2 - Leave on for 2/3 minutes; 3 - Rinse thoroughly; 4 - In case of contact with eyes, rinse them immediately. Mask: 1- Apply and massage to damp hair; 2 - Massage section by section; 3 - Leave on for a 5-15 minutes; 4 - Rinse thoroughly 5 - In case of contact with eyes, rinse them immediately.